The Milton Keynes Tattoo Convention was the perfect excuse for me to drop back home and indulge in some creature comforts over the weekend. I was hoping to see Scarlett, one of my models for Academink, get inked that day but she, and my girlfriend unfortunately couldn't make it. Needless to say, that didn't stop me checking out MK Ink's annual event to find out some more info on young people with tattoos for Academink II. I stepped into the Artists area a little daunted. Various conference rooms were crammed full of booths tattooing an incredible array of models, flanked by a restaurant that would later hold a disco into the night. I'm not exactly the most inked of men, and for the first few minutes, felt both slightly nervous and a fraud in comparison. These were immediately laid to rest as I spoke to Alex and Jules, the coffee vendors, who were awesome to talk to. Every time I explained my project, it was met with resounding support; none more so than from Jules. Over a quick coffee, they opened my eyes even further to the inked community. With Academink II in mind, I explored the convention looking for younger models to find out why and what they were having tattooed. I found Bianca having her incredible sleeve's penultimate ink by Esme. Bianca works for a courier firm, and is a huge fan of the story of snow white. By replacing snow white's face with that of a barbie's, in a vividly pink design, it truly was a work of art! I quickly saw Cory afterwards, where his Iron Man mask was being completed by Tattoo Guy. 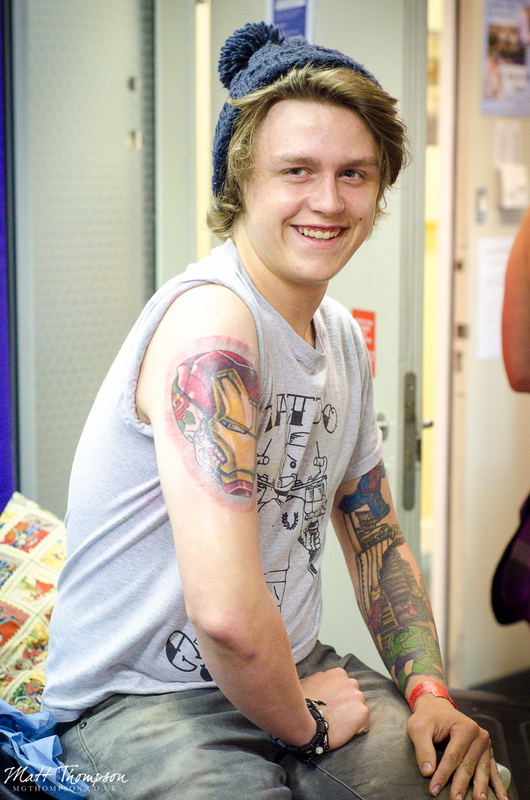 A qualified chef working at Nandos, Cory's love for Marvel characters screamed out from the sleeve on his other arm. He was keen to see my tattoo and hear about the project, and and more than happy to pose for a photo with his finished piece. Demi was listening to her iPod just opposite Cory, while Paul worked on her alice in wonderland piece. She's a support worker aiming to become a nurse, and so felt she needed to be able to easily hide the artwork she so loves. She didn't mind the fact it was just for her though. It wasn't easy to miss Claudia's fire-red hair, as she sketched a portrait of Jim Morrison. I've never been able to draw, so I was amazed at the accuracy she was able to copy from the photograph. The other models and artists found this hilarious because here I was marvelling at an apprentice's artwork, and ignoring the real tattooing just behind her. But that's exactly it - I was curious about her. At 17, she doesn't have any tattoos yet, but was following the path to become a fully fledged tattoo artist; and the skill she was already showing was fantastic. She told me it seemed the logical step for her after realising she could draw. My visit to the convention was unfortunately cut short, but it was a fantastic event. Everyone was an absolute pleasure to chat to! I'll definitely be going next year, hopefully with Academink II to exhibit! I've picked up a few business cards, including a creative make-up artists', so fingers are crossed that we can collaborate sometime. 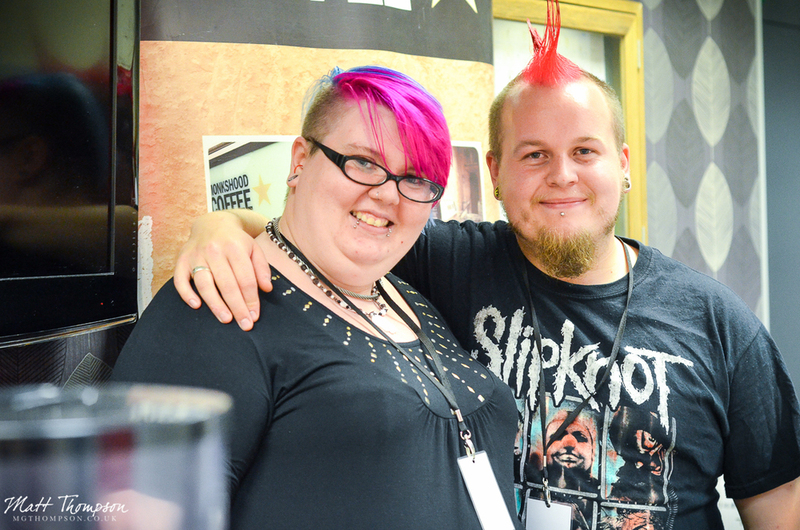 If you have the chance to attend one of these conventions, tattooed or not, check it out!